HBT6000 is the latest Bluetooth speaker released this year by AUVIO and I am so excited to review the speaker after their recent high-quality products. The original AUVIO Bluetooth speaker and AUVIO PBT1000 that I reviewed earlier are really solid speakers in their price range. However, I’m pretty sure they can’t satisfy the ears of fastidious music listeners. Therefore, there are a lot of expectations I put on this HBT6000, the biggest speaker in the product line. 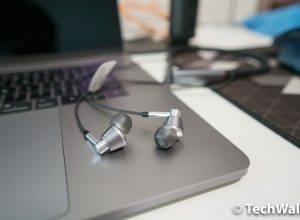 Continue reading the review to see if the speaker can beat your ears. 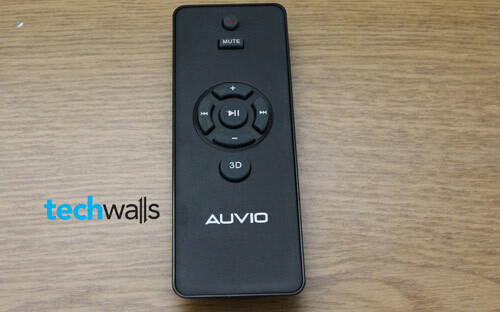 AUVIO HBT6000 is basically the larger version of the AUVIO PBT1000. 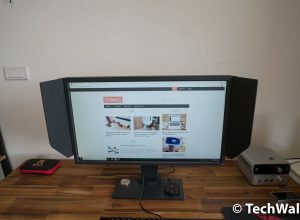 It has the similar design as I described in the previous review. Specifically, its dimensions are 4.7 × 14 × 5.2 inches (118 × 355 × 131 mm) and it weighs 5.7 lbs. Just check out some product images below. The most obvious differences we can see are the AC power adapter and the remote control. Yes, the speaker has no battery and you will have to plug it to power outlet all the time. So, the speaker is not totally wireless. Besides, the remote control is something new in the speaker. It allows you to easily control the speaker from a distance of around 19ft. It has some basic functionalities like Power, Mute, Volume Up, Volume Down, Next, Previous, Play/Pause and 3D (the new feature that we will discuss later in the review). I love the contemporary design on the HBT6000 as much as on other AUVIO’s products. However, with its big size and weigh, the speaker is not portable and can only be used as a stationary sound system for your average room. Honestly I didn’t expect much from sound quality of AUVIO’s speakers and specifically the HBT6000. Yet, I was totally wrong. The listening experience on this speaker is very impressive. The 60W system features 2 large speakers, 4 smaller ones and a bass port. It is more than enough to give me a stunning listening experience. 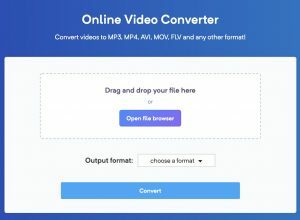 Check out our sound test in the video below (notice that the sound can’t be reproduced accurately after being recorded on camera). 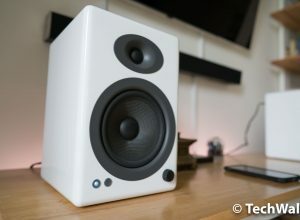 The speaker also features the new technology named Sonic Emotion Absolute 3D and it helps produce a solid, deep and rich sound throughout my room without any distortion. I was immersed in music and sounds, especially when I sit close to the speaker in a medium size room. The reproduced soundstage is amazing and I also really love its deep base sound. 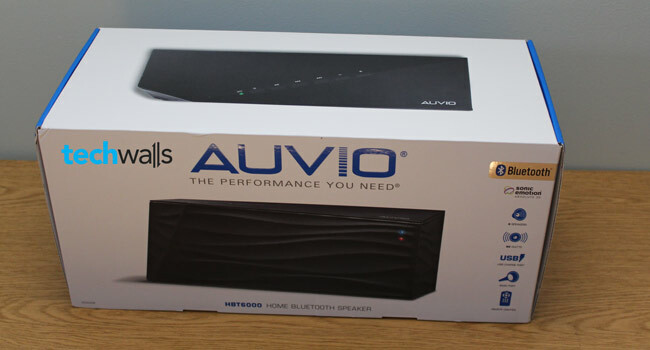 The HBT6000 delivers a much better sound than any other AUVIO product I reviewed. However, you will have to sacrifice some features such as using it as a speakerphone or backup battery. You still can charge your phone through USB port, but it won’t work when you don’t plug the speaker to power outlet. Therefore, the feature is almost useless for me. Another shortcoming of the speaker is its Bluetooth range. There is no problem if your device and speaker stay in the same room, but you will start losing signal immediately after you walk out of the door. Excellent sound for a medium room. Power cord is always required. No additional features like speakerphone or backup battery. Bluetooth range is just around 20 feet. The AUVIO HBT6000 is currently listed on Amazon for around $199 and this is a very reasonable price for the high-quality speaker. I recommend this product if you need a Bluetooth speaker for your room with no more redundant features. 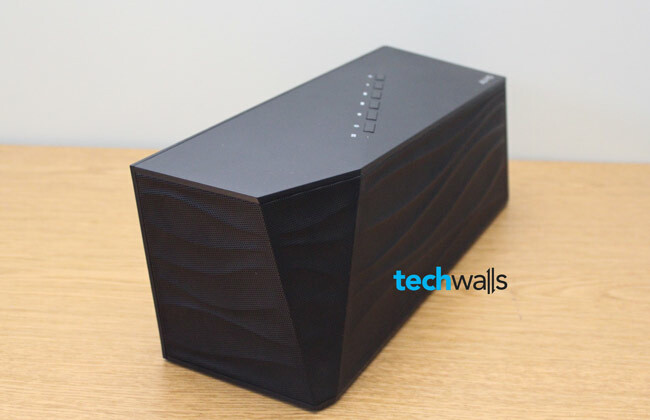 An awesome Bluetooth speaker for your room with no additional features. My auvio hbt 6000 will not connect via Bluetooth. When powered on the Bluetooth light flashes red once and doesn’t come back on. Can u help me with this.